The rooms and suites in the MGallery collection of boutique hotels offer modern comfort in an authentic setting. 1 Bedroom Villa is split level living with separate lounge area and breakfast bar, mini bar, bedroom with king bed, work desk, TV, luxurious ensuite with freestanding bath, large wardrobe and elevated timber deck. There's a cheeky mood as the day progresses and an air of anticipation astasting plates, share platters emerge from the kitchen. Evenings are vibrant and upbeat with a fluid, produce-first approach and an emphasis on shared dining experiences. Drift bar serves magnificent seasonal cocktails, local and imported beers, and a wide variety of wines and spirits. 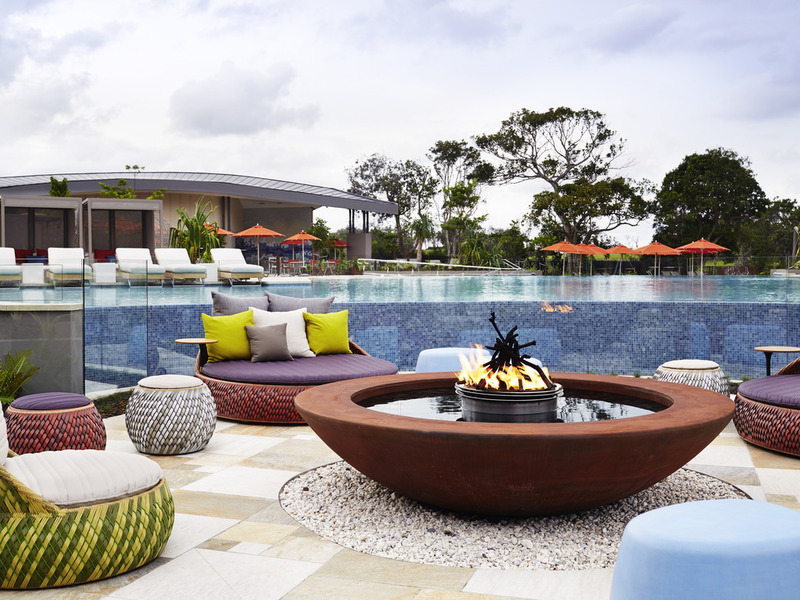 Our sunken fire pit, which sits alongside the infinity pool edge, is an intimate gathering place perfect for all occasions. The relaxed beachside bungalow layout and eco friendly feel was inviting, right on the beachfront looking back down the beach to Byron's hub and Lighthouse in the distance rather than being trapped in Byron, in the thick of things with limited central parking, and visitors moving like lava on busy weekends. If you want to visit Byron's hub from the resort, an easy half hour walk down the beach, or... two minutes to the unique solar rail will have you there in 15 mins. This marvellous blend of solar / battery technology and historic carriage system is ingenious. The staff are great, and the food is fresh and innovative. Having to pay extra for a not so good "barista" coffee, and the water in the dispenser to make tea at breakfast needs to be hotter, minor qualms in an overall relaxing mid week experience. Thank you for your review. Feedback is extremely important to our resort, allowing our team to make continuous improvements to ensure each guest experience meets expectation. We look forward to welcoming you back to the resort soon. Very clean and lots of great amenities! Staff is very friendly. Will definitely return should we ever return to down under :) Pool is very clean and a great place to relax. This property has its own access to the beach and the grounds have lots to do! My son enjoyed the giant chess board and playing Bocce ball. Thank you for choosing to stay at Elements of Byron and for your wonderful review. We're glad to hear you had a great stay. Perfect location. Peaceful quality place to stay. From the moment you arrive the attitude and service is well above expectations. As you walk into the villa it has a wonderful modern and stylish appeal set amongst the natural environment. The luxurious bed is amazing. Food at the restaurant is also quality and rounds out a perfect place for any holiday. Our only regret is we couldn’t stay longer! Thank you for your review. We are happy you had a fantastic time while on vacation at Elements of Byron. We hope to see you again soon. Overpriced try hard place to stay that is ‘sort of in Byron’ but you need to get a taxi to actually be in Byron. You pay premium $ to sleep in what is basically a mobile home on stumps. Suggest there are plenty of better places to stay that are actually in Byron! Thank you for reviewing Elements of Byron, our sincerest apologies your experience fell below expectation. Our luxury villas are beautifully designed for intimacy and convenience, whilst also being ecofriendly. A short stroll from reception will take guests to North Beach station where they can catch the Byron Bay train into the centre of town and back again, adding convenience to their day. We had stayed in Byron Bay recently, only closer to the centre of town. Even though out of school holidays we found the town area overrun with people. The peak times of the day were useless to travel in a car anywhere near town, even driving to and from. Staying at Elements - this was all avoided. If you can be independent for a few days and maybe walk into the town centre, if necessity has it, along the beachfront - then this is the place to be. This is a relaxing slightly remote area to the north of Byron centre, where you have access to the bush walks and beach without having to drive. The layout and construction of the walks is fantastic, putting you in a bash scenario within seconds of leaving your room if you wish. The facilities are fabulous, and as an middle aged couple we actually enjoyed the main pool with its vastness. The room was nicely decorated, quite open, balanced and thought out. We had a studio - Lagoon Edge Villa. This was nice in that we had access to the laundry which was a great (free) facility to have when traveling. The walk to the pool(s) or main pavilion also quite easy, and then a little further to the beach. The gym was not too bad but with 4 or more people we found it difficult to maneuver, not bad technology based equipment though. We had dinner in the restaurant one night and the quality was great. We were happy with our selection and possible options. Most people should find more than one to their liking. Wouldn't say it was as good as the Sofitel on the Gold Coast where we had stayed prior but very happy we stayed and ate here. This is quiet and peaceful for the most part. The staff all doing their part to make your stay feel seamless. High on the list to visit again. Thank you for taking the time to review Elements of Byron. Our staff are an asset to our resort with every effort made to ensure guests are looked after from the moment they check-in to the moment they check-out, feeling fully rested from their stay. We hope to see you again. Great property, friendly staff, I would recommend to anyone looking for somewhere to relax and unwind. From the moment we arrived the staff were friendly and provided a great overview of the resort and its facilities. The Villa was the perfect size for us and was close to the beachfront and pool. There was a great selection of food by the pool and in the restaurants. We will definitely be going back! Thank you for taking the time to review Elements of Byron. We hope to see you back at the resort soon for a relaxing vacation. Very dissapointed with the menu. There are no options for vegans. It was my birthday and we had to go into town to eat. No options in Cafe, restaurant or pool bar ( except for smoothies!). Given the location, the mission of the resort and hotel rating, a little consideration for the conscious eaters would be appreciated. We loved our stay at Elements as a mini moon post our wedding. We stayed 3 days, 2 nights. Accor silver member. Staff were friendly. The rooms and facilities were excellent. The restaurant was amazing and very accommodating for my wife with GF options. The only downside was that we tried to book in for massages etc at the day spa only to be told that there was no availability for the 3 days! We were looking forward to relaxing during our stay and getting a massage however this did not eventuate. It's not often that a hotel is better in real life than its brochure but Elements in Byron Bay far exceeded our expectations. Check in and check out is seemless with amazing staff all over the resort. Our bungalow was spotless and perfectly positioned for privacy. The pools are amazing with fantastic cabanas and lounges hanging over them, a great place to retreat to when the wind picks up on the beach. The fire pit was a great place for pre dinner drinks. We didn't eat in the restaurants so have no idea of the food. Overall one of the best places Ive stayed in a long time. The perfect chill out resort. We were travelling up from Sydney (moving to the Sunshine Coast). This was the final stop over and after a horrible hotel experience in Coffs Harbour this was the most welcome surprise. The resort is just beautiful with amazing faciltities and modern comfortable villas. We ate dinner in the restaurant and discussed how much we liked the place. So much so that I took a trip to reception and extended our stay an extra night. The reception staff were so helpful. A fantastic place, we will be back! We spent five nights at Elements and enjoyed every moment. Staff were excellent as was the food at Graze. There were sufficient activities on one rainy day to keep the children entertained. It will be good when the train can take you to Byron to avoid the traffic/parking problems. Great pool and well thought out beach club. We recently stayed here for 2 nights. The resort is located in a very quiet area and it is a short walk to the beach and a spectacular pool. It is a long but nice walk in to the township (around 50 minutes) but there is always Uber which we used on the way back and there is a soon to be opened train service which is around a 5 minute walk from the hotel. All the staff at the resort were super friendly and the restaurants had great food at a good price. We cannot wait to go back again !! Friendly and courteous staff. Great stand alone rooms in the bush. Amazing pool. Only downside was That as an Accor member was promised free upgrade subject to availability. Unlucky me. None available on a Thursday night. Apparently two weddings. Amazingly though I could have still booked the upgraded room online at 4pm that day. Second time this has happened. Mmmmmmm???? We wished we were clearly informed that we were getting the 'disabled option' studio room! We fell in love with this resort for so many reasons the first time we stayed in its Botanica Villa previously! Hence it was never a question to revisit this place the second time around. However, we wanted to checkout its studio villa this time around. Perhaps it was my mistake to expect every villa to have bathtub, as I was totally disappointment when I realised that I couldn't have a bath after a long stressful week from work. Something I was so looking forward to do. But to add further grief on that disappointment, we unexpectedly got the 'disabled option' studio villa! Which, I kid you not, really felt like we were in the hospital! Not only the shower/toilet area is specifically designed for guests with disability, but all the fittings were so cheap and nasty that the amount we pay for that studio villa really was not worth-it! Nonetheless, we felt beyond disappointed. This resort should notify their guests the exact room or villa descriptions they get. As it really does makes a huge difference when you get a villa that's designed for guests with disability, when you don't have any. Specially when the layout of its studio villa shown in its website is totally different, and in that website also states that 'Disabled option available'! Yes, it's an option! We 'could' come back to this resort if we had to, as apart from the last experience we had, everything else is great. I guess we just had to make sure that we get the right type of villa. But because of being badly informed about the room or the lack of it, it somehow affected our decision to consider that. Hence we started considering other resorts around the area. My rates/feedback on all aspects of this resort is purely base on this review and on our last visit or stay at this resort. Elements is a beautiful place, immaculate grounds and gardens, very helpful and friendly staff, the pool is huge and beautiful, with many sun beds with either sun or shade to relax in. The resort has everything, the breakfast was so fresh and too quality. The rooms were so well designed with heaps of storage spaces and so visually appealing that u instantly relax. We love elements and will definitely be back! Great location, would highly recommend. This eco experience was very nice with the rooms all beautifully appointed. It was just a pity that we only stayed the one night. Resort includes all the usual facilities, with a nice pool area and direct access to the beach. Awesome service at an awesome place! My partner and I booked a 2 night stay last week for our partnership anniversary and we would like to extend our appreciation to the following: ♥To the reservation agent who booked us into the system with excellent attention to detail. ♥To the Receptionist ~Paige who greeted us from the door and walked us to the desk, very welcoming, charming and informative. ♥To another Receptionist (I forgot her name but she's tall and wears eyeglasses). On our second day, I went to check the free Yoga session out but due to the rainy weather unfortunately the yoga teacher wasn't able to hold the class. This lovely receptionist booked us to a proper Yoga class in town and sent us via her own car. She also picked us up with towels waiting in the car. Given it's a relaxing and rejuvenating place to stay perfect for couples or families, the staff would top it off with fantastic service and personality. We would definitely come back to our fave resort in Byron!